I made the big move and headed eastward after last night in La Grange. Setting up the tent in another state park south of Lexington, with plans to shoot RJ Corman in Midway, and Frankfort, Kentucky, while remaining within striking distance of La Grange. Midway offers a few locations of it's own to enjoy! Frankfort, while containing street running, did'nt click with me. Maybe this fall if I return down this way, I'll see something I like there. In Midway however, I think you'll agree, this view from the second floor of an old civil war era hotel, is not too shabby, even with several flash units not set-up properly behind the power at "train time!" Not concerned, I reminded myself I was here for two more nights, we'll see this train again. The surprise was on me though, as I discovered with business down, this job did'nt seem to operate daily as it did in Fall of 2007 when I was here, and this was to be my only encounter with the GP 38-2s, (one on each end of train) this visit. 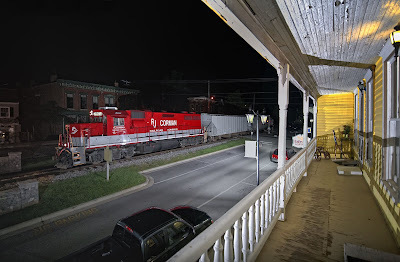 The ex-CSX line also hosts a night road freight which I planned to look up. After capturing this view, I carefully came down the creaky wooden steps back to street level and noticed a Versailles County Sheriff cruiser slowly coming down the street toward me. Stopping opposite me, the window drops down, I lean down to look inside...........and recognize Officer Alan Leigh! We had met here in Midway during my visit in Fall of 2007, and Alan has been included in my mailing list for night photos ever since! We recalled that night as being downright cold, featuring temps. in the low twenties! Frosty! After mentioning a drunk wandering around nearby, (you don't want him getting tangled up with one of your tripods....)Alan helped me out again tonight, ringing up the RJ Corman dispatcher for me, (as he had generously done in Oct. 2007) to inquire wether there would be any more trains passing through Midway overnight. The word that came down was no, there would not be. Thus saving me from hanging around five hours for nothing. After talking photography and how we were each doing overall, Alan continued on with his patrol, I thanked him for his help then picked up the lighting and drove over to La Grange, perhaps sixty miles away, arriving just in time to witness the last train of the night pass by! I expected this to happen more often than it did actually, with the low traffic levels. For those of you who are interested: the July issue of Outdoor Photographer Magazine features a photo essay entitled "Double Click" in Frans Lantings' bi-monthly column. Read Frans' column here: http://www.outdoorphotographer.com/columns/world-view/double-click.html Frans explains how he used six remote controlled flash units to capture images of bulldog bats hunting at night for fish over open water. His lighting technique is directly related to what I am doing with trains. He is partially submerged with equipment just above water level for the photo, I would never go that far.......ahem! Frans was the first to explain how flash units in multiples could be synched to the camera shutter up to 1/250 in an OP article in Oct. 2003. Reading Frans "How-To" article opened the door wide for me to interpret his techniques to light up and capture images of trains at night with flash units. Shot on May 11, 2009 at 23:04 with the 5D (1/200 & ISO 1600) and Nikkor 14 - 24/2.8 lens set at 20mm and f2.8. Flash units in the road erased in photoshop. Please enjoy! Comments are welcomed.